What Threat Would a North Korean Nuke Be, and How Would We Counter? Regardless of how many A-bombs (nuclear fission bombs) or H-bombs (boosted nuclear fission/fusion bombs) the Democratic People’s Republic of Korea has, a potential stockpile represents an incredibly deadly threat to regional safety and stability - and precisely for that reason, grants very little utility to North Korea’s military. Questions regarding the yield or deployability of North Korean nukes remain unanswered, but inferences can be made about the most likely means for these weapons to be deployed and potentially used in combat. As such, and given 50 years of Cold War legacy, the United States and its regional allies including South Korea are potentially prepared with countermeasures to prevent these weapons from being launched or to shoot them down if necessary. However, at least with interests towards self-preservation, it is unlikely a calmly-headed North Korean leadership will be in such a hurry to use weapons of mass-destruction (WMDs) - provided that leadership can remain calm and level-headed. During the Cold War, the prevailing policy of WMDs between the United States and the Soviet Union was known (perhaps appropriately enough) as MAD - Mutually Assured Destruction. This policy turned what would otherwise be purely offensive weapons of city-destroying power into powerful defensive deterrents - both nations effectively promised not to attack each other upon threat of retaliatory strike with nuclear weapons. This also gave rise to such terms as “first-strike” and “second-strike.” “First-strike” capability, while heavily invested in by both sides, was regarded as an incredibly huge and apocalyptic no-no. As the name implies, it refers to a nation’s ability to pre-emptively destroy another nation with WMDs. “Second-strike” capability is again as the name implies - a nation’s ability to respond to a nuclear weapons strike with one in kind, whether before the enemy nation’s nukes hit or even after. This is the reason why massively armored, underground launch bunkers and silos exist, as well as the United States’ and Russia’s fleets of nuke-lobbing submarines and NORAD. NORAD’s ability to detect a “first strike” in progress was considered one of the most important capabilities during the Cold War, and to be able to retaliate with surviving nuclear missile silos or submarines safely out of harm’s way at sea. Having overwhelming “first-strike” capability meant, at least in theory, that the other side would be hesitant to launch a “first-strike” of their own; having “second-strike” capability gave the other side pause when also considering a “first-strike” if they had lead themselves to believe they could either easily survive any retaliation or completely wipe out the enemy’s ability to do so during the initial strike. In other words, the use of nuclear weapons to achieve military goals and objectives blocking conventional forces through the outright destruction of the enemy. Nukes would be used to clear a path for the advancing North Korean army and destroy a portion up to the majority of South Korean or American defenders. Strategic centers, such as the South Korean capital of Seoul or the major port city of Busan would also be targeted and destroyed. By clearing a path of defenders and targeting and killing major population centers through wanton destruction, North Korea would hope to bring the South to quick capitulation and an equally quick victory. If North Korea were to go “over the border” with a massive army, regional allies of South Korea and the United States may come to the South’s aid. These could most potentially include Japan, which has a very powerful military on par with South Korea’s in terms of both raw on-paper numbers and technical sophistication - a power that North Korea cannot hope to match without WMDs. If Japan were to declare an active state of war against North Korea, North Korea most likely will respond with nuclear strikes against as many Japanese population centers they can target, including Tokyo, in the hopes of outright and immediately knocking Japan out of the war completely. By using WMDs to destroy such a massive amount of Japanese infrastructure and population, combined with Japan’s own cultural legacy of nuclear weapons, the North Koreans would hope to bring Japan in a position to sue for peace within mere hours of a declaration of war. This would then leave North Korea’s conventional military free to deal with South Korea, who would also see the destruction and perhaps be enticed to sue for peace as well. This, however, is North Korea’s most useful policy of nuclear weapons deployment. For whatever capability the North has to use nuclear weapons, it will always remain a mere shadow of what the United States can deploy. If North Korea uses nuclear weapons against targets in South Korea, Japan, or even on the U.S. West Coast, the United States will retaliate with a barrage of weapons such as the MGM-30 Minuteman III missile from land-based silos or the D5 Trident submarine-launched missile. Each missile carries at least three to four warheads that can be independently targeted, each either targeting different cities or different quadrants of a sprawling metropolis. There are more than enough Minuteman IIIs and D5 Tridents in the United States nuclear arsenal to ensure that the land area occupied by the Democratic People’s Republic of Korea can never, ever be inhabited again in the remaining history of this planet. In contrast, the North Korean nuclear arsenal can certainly create massive destruction and kill a large number of people, but is insufficient to more than temporarily cripple the civilian infrastructure of South Korea, Japan or especially the United States. That said, no nation wants to see millions of its own people die. The North Koreans can use this threat as a means to say leave us alone. The Hermit Kingdom is called such for a reason, and nuclear weapons may not allow a “unification” with the South but they can ensure that the despotic regimes and legacy of the Kim dynasty can be allowed to exist and rule over their private fiefdoms. Whatever nuclear weapons policy the North Koreans have adopted, it is useless without making that threat real. This means having vehicles or launch platforms that are capable of dropping these warheads onto heavily-defended population centers hundreds up to thousands of miles away. The United States and the Soviet Union/Russia has invested billions if not trillions into missiles that can circle the globe, bombers that can break the speed of sound or disappear on radar, and submarines that can prowl the seas longer than their crews can stand. North Korea’s ability to replicate this capability is extremely limited with questions regarding being able to survive a heavily contested battlespace, having sufficient range or being physically capable of carrying a nuclear warhead at all. North Korea’s land-based missiles are mostly shrouded in mystery, but a combination of North Korea’s rush to push out propaganda and inferences based on known information give a solid enough picture of the raw statistics of these delivery platforms. The most troubling of what is not known is how many of these missiles are in the North’s inventory, and whether or not they possess nuclear warheads small enough to actually fit on these missiles. North Korea claims an extensive family of long-range missiles, perhaps the most tactically/strategically flexible is the BM25 Musudan, based on the Soviet R-27 Zyb submarine-launched nuclear missile. The BM25 Musudan is transported and launched from a very large multi-axle vehicle in the same fashion as the optionally conventional/nuclear-armed “Scud” missiles made famous during Operation Desert Storm. This transporter/launcher is what gives the BM25 Musudan its tactical and strategic flexibility - its launch location is limited to where it can drive on the Korean peninsula, which means locating and destroying them becomes an even greater intelligence effort. The BM25 Musudan can strike any location in South Korea or Japan regardless where it is launched from North Korea, although it has insufficient range to hit the U.S. mainland (though it still may be able to strike important U.S. air and naval bases in the Pacific). The only known and confirmed missile North Korea possesses that can strike the U.S. mainland is the Taepodong-2, with varying reports of how operational this missile is or even if it’s intended to be an operational missile as opposed to a prototype or test article. Regardless, the Taepodong-2 is typically regarded as being capable of only striking the West Coast, and there is doubt if North Korea can manufacture a nuclear warhead small enough to fit onboard the missile. Regardless, North Korea could still fit an alternative WMD warhead - for example, mass-spreading chemical weapons or a biological agent - that would be able to kill hundreds of thousands or millions of people along the densely populated West Coast. North Korea also has a variety of other shorter-range missiles, from the aforementioned “Scud” to missiles derived from obsolete surface-to-air missiles such as the S-75 (or SA-2 “Guideline”) that have had their guidance systems and aircraft-killing fragmentation warheads removed and used as “dumbfire” WMD delivery platforms. Such missiles may be able to strike at targets located in the western half of Japan, but more importantly would be able to strike at strategic targets or massed army formations within South Korea. These missiles would travel with conventional North Korean forces as they advance south, increasing the number of targets they can reach. An SM-3 missile is launched from the USS Lake Erie during a Ballistic Missile Defense test. Official United States Navy photo. Even if the North Koreans are able to launch a missile at Los Angeles, the United States possesses an extensive array of countermeasures capable of shooting down such weapons. These defenses are centered around the Aegis Ballistic Missile Defense System which is a combination of advanced radars capable of tracking exo-atmospheric targets and missiles capable of intercepting them. The U.S. Navy’s Aegis radar system was originally developed to counter and shoot down massed Soviet cruise missile launches aimed at aircraft carriers, and as such is capable of tracking dozens upon dozens of targets at once. It has been progressively updated through decades of service to remain perhaps the premiere military radar system in the world. Aegis is able to achieve ballistic missile defense capability when paired with the Standard SM-3 missile, which is capable of intercepting nuclear-tipped missiles during multiple launch stages. A Ticonderoga class cruiser, which debuted the Aegis radar system, is able to max out at a staggering 122 SM-3 missiles, though very rarely if ever do they deploy with such a large number. A (very slightly) smaller Arleigh Burke class Aegis destroyer can max out at about 96 SM-3 missiles. The Japanese Naval Self-Defense Force has four Kongo Aegis destroyers and at least two Atago class ships, more or less improved copies of the Arleigh Burke class ship and sharing identical BMD capability. The South Korean Navy also has about four King Sejong the Great class Aegis destroyers, again improved and larger versions of the Arleigh Burke design, that have a total missile capacity in-between an Arleigh Burke class destroyer and a Ticonderoga class cruiser. For back-up defense, or for countering short-range nuclear missiles, all three countries are also equipped with various “layered” defense measures, perhaps most notably the PATRIOT PAC-3 (PATRIOT Advanced Capability Mark-3) surface-to-air missile, a perfected version of what was deployed to Desert Storm to shoot down Saddam Hussein’s Scuds. All of these systems were designed to counter mass Soviet-style “first-strike” capability; the North Koreans would have to possess a relatively large number of Taepodong-2 missiles in order to over-saturate these defenses. North Korea’s most flexible and deadly means of all for nuclear weapons delivery is to use a sea-based option, principally from missile-launching submarines ala the United States and the Soviet Union/Russia. Missile-launching submarines would effectively have the entire Pacific Ocean to hide in, and can make up for any range deficiencies in their missiles by parking close to shorelines. The United States Navy and its regional allies have sophisticated submarine-detecting equipment, but the means to find submarines is still dependent on having at least a general idea of where they may be - and the Pacific still leaves ample space for even “noisy” submarines to hide in. Given that, North Korea’s ability to field a missile and a submarine to match has yet to be verified, despite photographic evidence that may or may not be doctored. North Korea’s most sophisticated launch platform of all is the Sampo-class submarine, which may also double as a “hunter-killer” against other submarines. The Sampo is typically acknowledged as being able to carry only one BM25 Musudan-type missile, itself already based on a Soviet submarine missile design. This pales in comparison to the typical two dozen or so missiles an American or Russian submarine can carry, but especially if Sampo class submarines are deployed en-masse, one would be enough. Some North Korean military experts have surmised that ships disguised as civilian freighters may also be used as launch platforms. Instead of using the sea itself to stealthily evade enemy forces, they would use a classic North Korean tactic of deception to hide in plain sight. A Virginia-class attack submarine. Official United States Navy photo. In addition to being able to intercept missile launches, the same U.S. Navy and Allied ships are also equipped with extensive sub-hunting equipment. An Arleigh Burke class destroyer, for example, has a powerful bow-mounted sonar to detect submarines, and can either use one of two SH-60 Sea Hawk helicopters to aid in finding a sub with their own on-board equipment and launch torpedoes, or the destroyer can launch torpedoes itself. Perhaps the most powerful Anti-Submarine Warfare (ASW) asset in U.S. Navy possession is the Virginia-class attack submarine. With its unlimited-range nuclear powerplant and heavyweight Mk 48 homing torpedoes, a Virginia-class submarine represents a threat the North Korean Navy would find hard to counter. That is, provided the U.S. Navy and its allies can find North Korean submarines. The U.S. Navy has an extensive array of assets dedicated to finding submarines, from other submarines and ships to listening devices planted on the ocean floor to even orbital satellites, but there is enough ocean out there to ensure at least some hiding space. The North Korean Air Force is extremely poorly equipped to deliver nuclear weapons. Most likely a North Korean bomber would deliver an unguided “dumb” bomb in the same manner as conducted during WWII, and there is serious question if North Korea has an aircraft with sufficient range and warload capability considering North Korea’s ability to “minaturize” nuclear weapons. In either case, such an aircraft is highly vulnerable to modern air defense systems. The most likely carrier aircraft is an ancient Ilyushin Il-28, nicknamed “Beagle” by NATO. This is a comparatively slow aircraft that looks like a Christmas tree on radar, and while being North Korea’s biggest bomber it still may lack the range and warload to deliver a nuclear device deep into enemy territory. More survivable aircraft that could potentially deliver nuclear weapons include MiG-19s (or Chinese copies), MiG-23s and MiG-29s, but again, would be vulnerable to modern air defenses, would only carry a single bomb at best and would perhaps be better used in other roles unless the North were that desperate to conduct a nuclear strike. They would also stand little chance against a Republic of Korea Air Force F-15K “SLAM Eagle,” which despite the boisterous name can detect and engage multiple targets at once from long-range with AIM-120C anti-aircraft missiles. It is also possible North Korea could miniturize a nuclear warhead to be fired from an artillery cannon. The United States and Soviet Union briefly fielded nuclear cannons before being replaced by missiles, and developed warheads that could be deployed from more standard artillery. 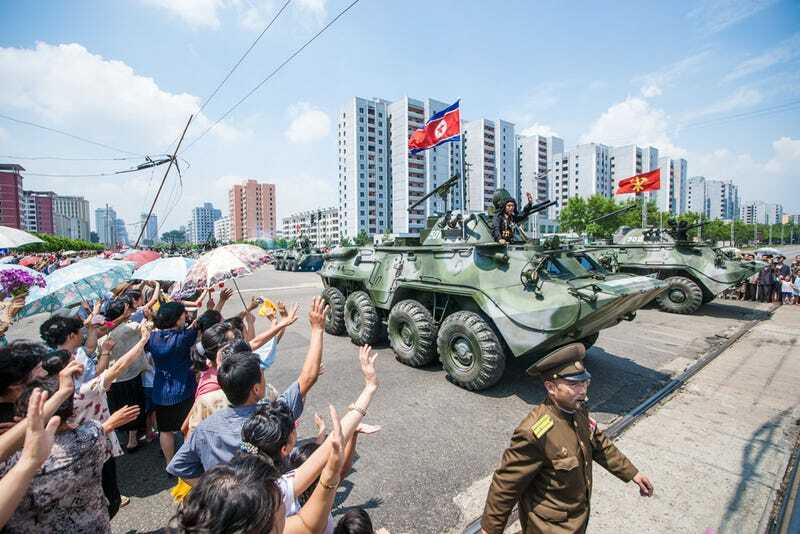 North Korea manufactures a mobile cannon called the Koksan, based off a Soviet WWII-era naval weapon. If equipped with nuclear shells, it could cause massive destruction to military formations or be used to bombard major population centers like Seoul - but at such range, its own operators or allied forces could experience radiation “blowback.” The tactical situation and concerns of North Korea’s leadership would probably care little, however.